To pick the right wine match for a dish, think about the sauce. F&W’s Kristin Donnelly finds the best jarred sauces in a massive taste test, then Ray Isle goes on a pairing spree. Great as a dip or a spread, the Delouis Fils aioli is creamy and nicely garlicky. $7; igourmet.com. Wines that have light, fresh acidity lift the flavors of olive oil–based sauces like aioli. 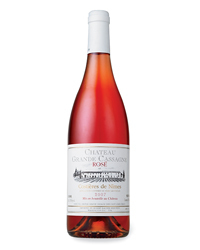 The 2007 Chateau Grande Cassagne Rosé ($13, above) is a great one. Plus: Rosé: Underrated or Overhyped? Coconutty, with mellow spices, Thai yellow curry from Trader Joe’s is terrific with chicken. $3; Trader Joe’s. Coconut milk–based curries need a big white that can stand up to their potent flavors. Seek out the lush 2007 Girard Russian River Valley Chardonnay ($24). Thai Kitchen’s Peanut Satay Sauce is a perfect balance of sweet and savory. $5; thaikitchen.com. Sweet sauces go best with slightly sweet wines, like the 2007 Hogue Cellars Genesis Riesling ($16)—and, in turn, make the wine taste refreshing. Creamy tomato-based curry from Seeds of Change is mildly spicy. $3.50; seedsofchangefoods.com. 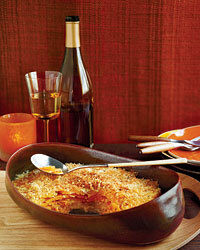 Moderately tannic, fruity wines like California Pinot Noir pair well with rich sauces. Try the 2007 La Crema Monterey Pinot Noir ($25). Tangy marinara from the famed Rao’s in NYC tastes homemade. $17 for three 15.5-oz jars; raos.com. Italian reds tend to show a bright acidity that matches well with tart ingredients like tomatoes. The 2006 Toscolo Chianti Classico ($20) is superb. SchoolHouse Kitchen’s peppery dressing is fresh-tasting. $14 for two 12-oz bottles; schoolhousekitchen.org. Wines with zesty citrus notes have the zing necessary to balance tart vinaigrettes. Look for the 2007 Franciscan Napa Valley Sauvignon Blanc ($17). Tenuta di Ferento’s Merlano line includes a richly flavored black-olive spread. $9; olio2go.com. Foods with deep, earthy notes go best with red wines full of substantial, ripe fruit, such as the berry-rich 2006 Dancing Bull Zinfandel ($12).